The animal kingdom is full of amazing feats of nature like the ability to camouflage, fly at great heights and incredible strength is one other such quality. Now let us come to the strongest animals and as this list proves, is not related to the size of the animal but rather the kind of activities it can do as compared to its size. Here is a list of the ten strongest animals in the world. This animal may seem like an unlikely contender for the top spot on this list of the strongest animals in the world but it is miraculously strong as compared to its size. It is only half an inch long (about 1.5 cms) but can lift weights that are more than one thousand times its body weight. This strength is used to carry balls of dung. Because male dung beetles battle each other with their horns, they develop this kind of strength. 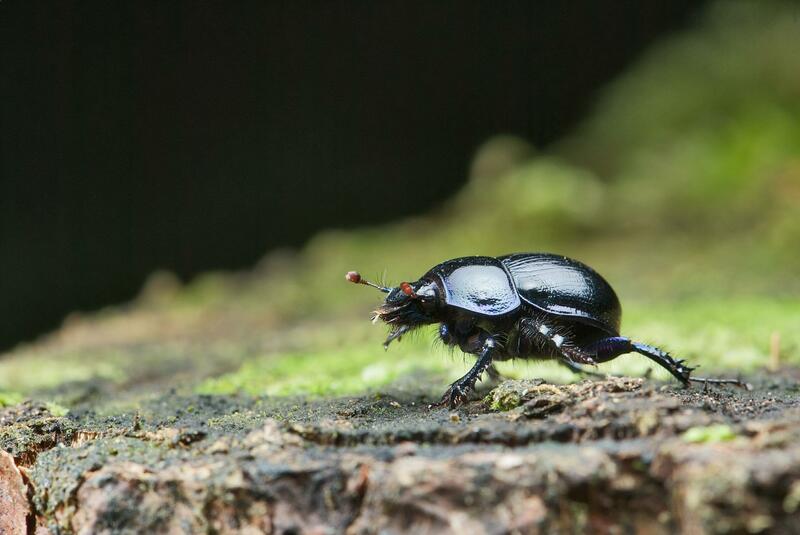 There are three types of dung beetles – dwellers who live in dung balls, rollers who roll the dung into balls and push them to their nests and tunnelers who take the dung balls back to their underground tunnels. Leptodirus Beetle is one of the blind animals in the world. You can also read about the most dangerous amazon rainforest animals. The solitary eagles lay eggs inside the dung or it can be in the underground burrows. The beetle gets complete transformation undergoing a complete metamorphosis that means they need to pass several changes in the body shape before they completely formed dung beetles. There are various stages of Metamorphosis that includes larvae and pupa before adult insect is formed. The average lifespan of the species is 3 to 5 years,howvever, it depends on the species. The second strongest animal in the world is also an insect and a beetle. This spot is occupied by the Rhino beetle, so named because of the two large horns on the thorax and head of the male. They are the largest beetles in the world and can be as large as 6 inches. They can carry weights 850 times more than their body weight which is equal to a human being carrying 65 tons. The horns are used to attract mates, fight other males and to clear any debris that may lie in the way of the beetle. One of the strongest animals has two sets of wings and they are capable of flying. The outer part of the wing actually protects the real working wings underneath. Because of its hollow characteristics, it does not interfere with the flying ability of the beetle. They belong to the Scarab Beetle family and are totally harmless to humans. The species dont usually bite, sting, or carry any type of poisonous venom. The main predators of the species are birds and snakes. Miraculously, the third strongest animal in the world is also an animal, but not a beetle. The leafcutter ant also called Parasol Ant is named after the way it cuts leaves and carries them to its nest. This tiny and is just over one centimetre in length and can carry around a weight 50 times its own. Not just this, it can also walk long distances carrying this weight. This ant moves its jaws one thousand times in a second and has very powerful jaw muscles. Nests of leaf-cutter ants are seen as a threat to farmlands because collectively, they can cut the leaves of thousands of crops in a very short time, destroying the yield. You can also read about non-venomous snakes in the world. The ant species lives in huge colonies mostly on the forest floor. The colonies of the species are very complex and each and every ant is specialized to play a significant role in the family. It varies in size and appearance, howvever, sometimes there physical differences are so large that is hard to believe that the species belongs to the same family. Some are large, some are small and even some has winged. The ants are mostly seen in lines bringing back pieces of leaves back to the nest. Elephants are the largest land mammals that are still living and the African Elephant is the largest species of elephant, slightly larger and heavier than the Asian Elephant. African Elephants can weigh up to 7 tons and can be more than 12 feet in height. They can also lift weights more than their own. Both male and female African Elephants have tusks that can also be as long as 2.5 meters. The trunks of elephants are very sensitive because they have 4000 muscles in them. Elephants use these trunks to defend themselves, forage for food, carry weights and fight other males. This makes them one of the strongest animals in the World. You can also read about a few strange animals found only in Africa. The skin of the elephant is one inch thick, howvever, it can burn in the on the sun if it is not protected. The largest mammal protects mud to cover its skin and protect it from the sun. One of the strongest animals and intelligent too can recognize them in the mirror. It does not like to eat peanuts and because of its large size, it needs to eat 150kg of vegetation per day. Another familiar animal on this list is the largest living primate which can weigh up to 200 kilos and have a height of over 1.7 meters. Gorillas have very large and long arms that they use to carry objects 10 times heavier than their body weight. They use their arms to balance themselves while walking by using their knuckles. They also use their arms to fight other males, defend from predators or protect their tribe from invaders. It is estimated that a full-grown Gorilla possesses 20 times the strength of a full grown human. We have also covered the most dangerous animals in the world. Gorilla build nests using leaves and the nest can be located on the trees or on the ground, however, gorilla does not like to sleep in the same nest twice. They often change nests to protect themselves from predators such as leopards and crocodiles. The species can mate anytime in the year and the pregnancy in female lasts 8.5 months and ends with one baby. Female species are devoted mothers because they can even carry them in the arms once they learn to walk. After the largest primate, the next strongest animal in the world is the largest cat – the tiger. This majestic animal can weigh more than 300 kilos and has strong legs and jaws. Of the 10 known subspecies of the tiger, the Siberian Tiger is the largest though the population is declining rapidly. Listed under the world’s most amazing animals are expert hunters and use the muscles in their legs to chase and pounce on prey while the long canines and strong jaw are used to suffocate and kill the prey. It is one of the best land animals in the world. They are solitary hunters and can kill animals larger than them including wild oxen, large antelopes and sometimes bears. Males battle each other for females and most tigers fight each other for territorial disputes. They belong to the family of cats, here we have listed largest cat breeds in the world. Oxen are the only domestic animals to make it to the list of the strongest animal in the world. They have been used as draft animals to carry weights since 4000 BC and can carry heavy weights for a long period of time. They weigh a maximum of 640 kilos but can carry as much as 800 kilos over long distances. Though they are not as fast as horses, they have far more endurance and a very useful farm and transport animals. Oxen are very calm animals and obey commands without hesitation. You can also read about a few color changing animals in the world. One of the fierce animals in the world, Grizzly bears are only found in North America and are known to be fierce animals very protective of their territory and young ones. They can weigh up to 350 kilos and have a height of 2.5 meters with males being larger than females. They have very powerful legs with sharp 6 inch long claws. Their jaws can also bite with a force of 1200 pounds per square inch, which is enough to crush a bowling ball, and the skull of their prey. They have an irritable temperament and are frequently known to attack humans whom they see as a threat. They are also listed in apex predators in the world. The only reptile to have made it to the list of ten strongest animals in the world, this snake is not poisonous but has very strong body muscles. There are four known types of anacondas, of which the Green anaconda is the largest. Contrary to popular belief, anacondas are not poisonous but they can bite the prey with great force. The first strike at the prey with great force and speed and then suffocate it by tightly coiling their bodies around it. This is the reason they fall under the category of constrictor snakes. They can kill prey much larger than their own size including wild pigs, Caimans, and Jaguars. This is the only bird on the list of the strongest animals and is considered to be one of the strongest because of its incredible ability to life heavy prey about four times its own weight. They also hunt large animals like foxes and wild cats as well as the young ones of almost all animals. They also fly at great heights and glide for long periods using wind currents. This is possible because of their strong wing muscles. They also have excellent vision, strong and sharp talons and can dive at amazing speeds to catch the prey by surprise. Along with humans, there are many intelligent animals which can use there mind in a proper format. Here are a few smartest animals in the world. This surprising list of the strongest animals in the world proves that one does not have to be large to be strong. Tiny animals like beetles and ants can demonstrate incredible feats of strength by lifting weights many hundreds of times their own weight. Have you seen any of these strongest animals in the world? The next time you see an ant or a beetle, be sure to think about this list.